Although there are a lot of new features and functions added in to Windows Server in the past couple revisions (2012 and 2008 R2) that make the headlines, one of the first places I like to start is around the things that don’t make the headlines that are really core technology improvements from which many of the features are built from. These are technologies that make the new operating system faster, more reliable, and do more things—but they aren’t features that you have to install or configure. One of the embedded technologies in Windows Server 2008 and extended into Windows Server 2012 is self-healing New Technology File System (NTFS). Effectively, the operating system has a worker thread that runs in the background, which makes corrections to the file system when NTFS detects a corrupt file or directory. In the past when there was a file system problem, you typically had to reboot the server for chkdsk to run and clean up file and directory corrupt errors. This self-healing function is not something you will ever see running; however, it is an added capability under the hood in Windows Server 2012 that keeps the operating system running reliably and with fewer system problems. Introduced in Windows Server 2012 is Server Message Block 3.0, more commonly called SMB3 or SMB for short. SMB is a protocol that handles the transfer of files between systems. Effectively, SMB compresses file communications and, through a larger communications buffer, is able to reduce the number of round trips needed when transmitting data between systems. It is analogous to the difference between the copy command and the xcopy command in DOS. The copy command reads, writes, reads, writes information. The xcopy command reads, reads, reads information and then writes, writes, writes the information. Because more information is read into a buffer and transferred in bulk, the information is transmitted significantly faster. Most users on a high-speed local-area network (LAN) won’t notice the improvements when opening and saving files out of something like Microsoft Office against a Windows Server 2012 system; however, for users who might be copying up large image files or data sets between systems will find the information copying 10 to 30 times faster. The performance improvement is very noticeable in wide-area network (WAN) situations on networks with high latency. Because a typical transfer of files requires short read and write segments of data, a file could take minutes to transfer across a WAN that can transfer in seconds between SMB-connected systems because the round-trip chatter is drastically reduced. For SMB3 to work effectively, the systems on both ends need to be Windows Server 2012, or Windows 8 systems. A Windows XP client to a Windows Server 2012 server will communicate over SMB 1.0 for backward compatibility and will not gain from this new technology. In addition, when talking to Windows 7 or Windows Server 2008 R2 machines they can only negotiate up to SMB 2.1. Significant to Windows Server 2012 in regards to SMB is Microsoft’s inclusion of SMB for clustering and replication technologies built in to the new operating system. It used to be that if you wanted to setup a clustered server environment, you needed a storage-area network (SAN) shared stored solution to failover clustered servers from one to another. With Windows Server 2012, clustering can be done simply with SMB. Two Hyper-V hosts can be set up, load on the Failover Clustering feature, set up a basic Windows 2012 file server, point the servers to an (SMB file share) of the file server, and build the cluster without a SAN. Hyper-V is a technology built in to the core of the operating system in Windows Server 2008 and expanded in Windows Server 2012 that greatly enhances the performance and capabilities of server virtualization in a Windows environment. In the past, virtual server software sat on top of the network operating system and each guest session was dependent on many shared components of the operating system. As mentioned in the previous section on Hyper-V and the ability to create a cluster with SMB file storage, there have been other very significant improvements in Hyper-V, including the ability to do site-to-site replication of Hyper-V guest sessions. Instead of purchasing expensive replication technologies, Hyper-V hosts can be pointed to one another for server to server replication. A number of other technologies have been greatly improved in Windows Server 2012. Storage spaces represent a significant inclusion in Windows Server 2012, effectively the ability to group together storage space on multiple servers and having them displayed and accessible as a single storage share. Storage spaces work in the same way that RAID drive mirroring or RAID striping works, replicating or striping data across drives for higher availability. With storage spaces, however, the mirroring and striping can be done across systems. So, instead of having two drives mirrored in one server (with the server as a bottleneck or point of failure), the two drives can be in two separate servers, and the mirroring happens between the two servers. Or three drives can be split across three different servers and striped across the three servers providing both storage resilience as well as server resilience. The concept of mirroring and striping storage spaces on small 50GB or 100GB levels doesn’t register as a benefit for most IT people because mirroring 100GB drives is done all the time inside a server. But what if you want to create a 10TB video, media, and large-image storage repository, and that “server” that the 10TB disks are in fails? What will it take to restore 10TB from tape? Or what if you want to copy the 10TB to another server? It will take an extremely long time, which is why organizations buy external SAN storage, to put large amounts of data and then snapshot that large amount of data for redundancy. But what if you create two servers or three servers or five servers with each 10TB or 5TB and mirror or stripe the storage across multiple servers? Now you have no single point of failure, the servers have data mirrored or striped, the servers are redundant, and you do this all at a fraction of the cost of a SAN or SAN plus snapshots. Add in all of this the flexibility provided by SMB shares as an underlying technology for high-speed data clustering and site replication, and storage spaces start to make a lot of sense. Figure 1. 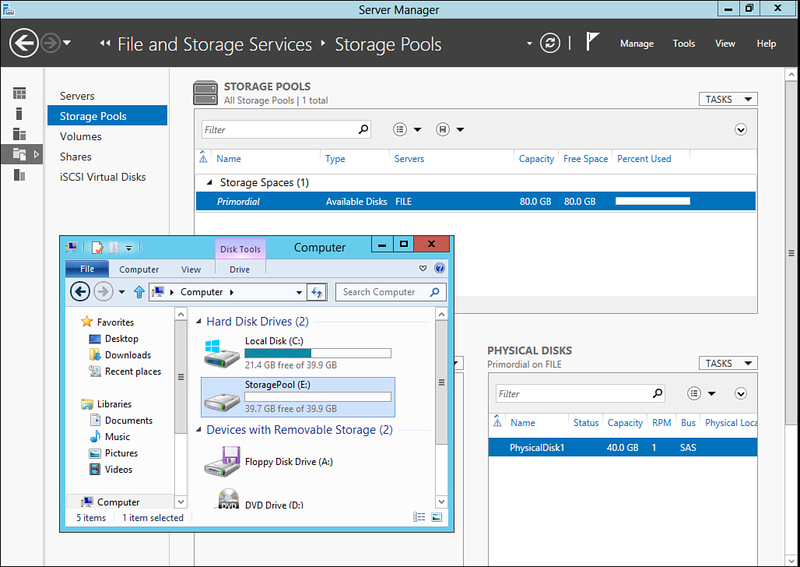 Storage Spaces in Windows Server 2012. De-dupe, or data de-duplication is built in to Windows Server 2012 and is the ability for basic Windows 2012 file system storage to be de-duplicated to decrease storage capacity demands. As an example, if a 10TB share of data has the same video 20 times with variations of the video from early draft cuts through near final and final versions, the video could take up a lot of disk space. Data de-duplication acknowledges the replication of bits on the disk, and instead of having the same data multiple times, it flags the data as duplicates and opens up space for the storage of other information. In many cases, data de-duplication has saved 30% to upward of 70%, with averages being somewhere in the middle. Organizations with 10TB of space are often able to achieve 50% to 55% space reduction, and no longer have to purchase more storage as they reach 10TB that might be the limit of their current storage subsystem. This 50% savings could prevent the organization from buying more storage for another year or two, potentially a huge benefit to organizations today.